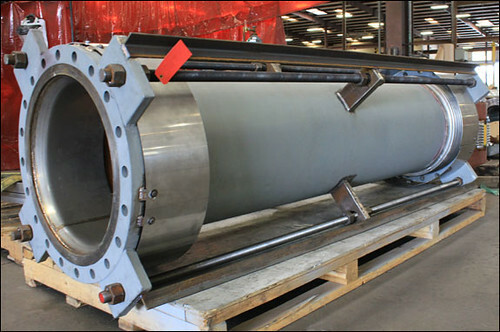 U.S. Bellows designed and manufactured this universal expansion joint in accordance with ASME section VIII for an oil and gas refinery in Europe. A U2A- form was furnished as part of the units’ documentation. The expansion joint has a 24″ diameter and 103″ overall length. The bellows, liners and covers are fabricated from 316 stainless steel, and the flanges, tie-rods and pipe are carbon steel. The unit is designed for an operating temperature of 181°F at 101 psig and 1″ axial movement with a 3″ lateral offset. The bellows and pipe longitudinal weld seams were x-rayed, dye-penetrant and hydro- tested prior to shipment.